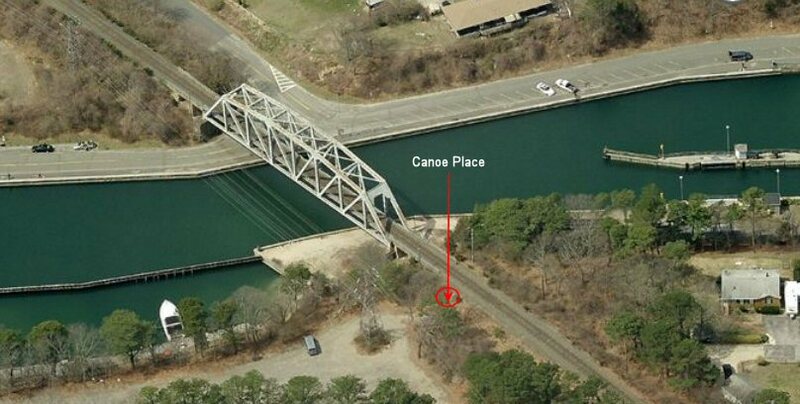 CANOE PLACE: Low cinder platform stop on southeast side of Shinnecock Canal. 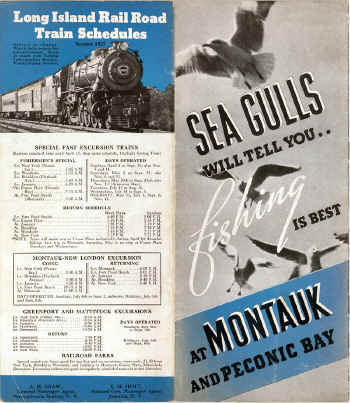 1935-1953 for “Fisherman’s Special” trains. 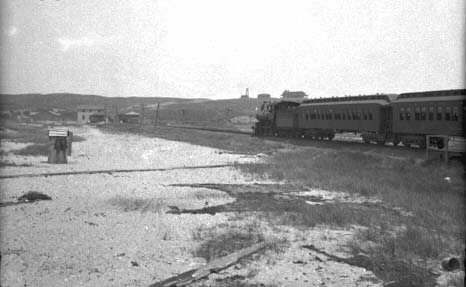 The white flag special with wooden parlor cars headed into the old Montauk station, with partial platform for the fishing station stop visible at the far right. 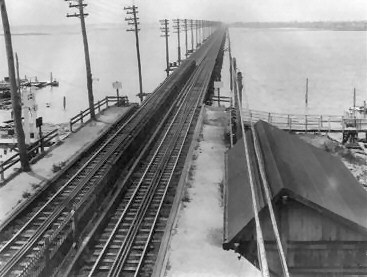 This view is c. 1910. 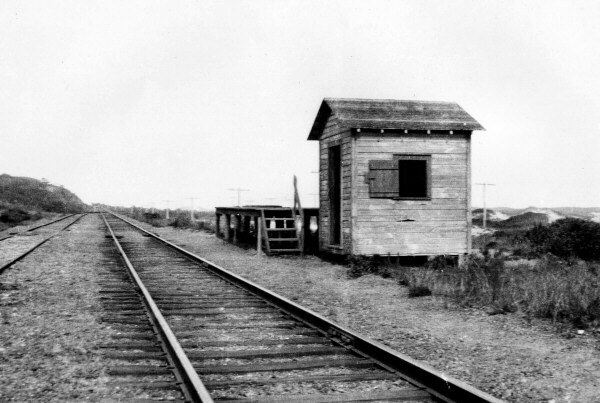 The old one-story depot had an upstairs added in 1907. 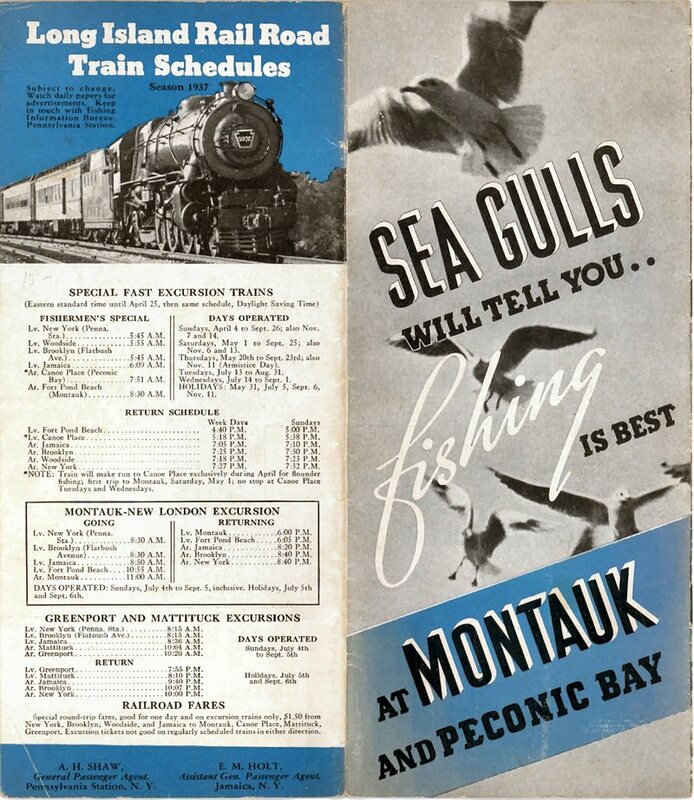 I don't believe "Fishermen's Specials" were specific to station stops along the Rockaway Beach Branch. Just a scheduled MU train (with no express car to carry the fish on ice) stopping at the station and fishermen getting on/ off with his rod and reel and a bag to carry his catch. 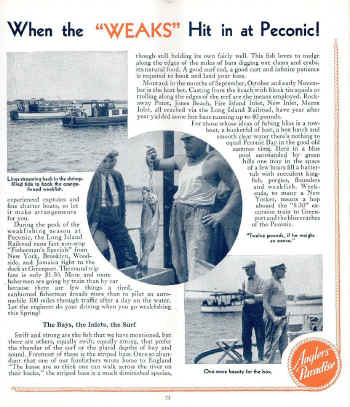 "The Bay's fishing tradition prospered after the Civil War, when ferries carried vacationers from Canarsie, Brooklyn to beaches on the nearby Rockaway Peninsula. The bay islands remained sparsely populated until 1880, when the New York, Woodhaven, and Rockaway Railroad erected a 4.8-mile-long wooden trestle across Jamaica Bay. 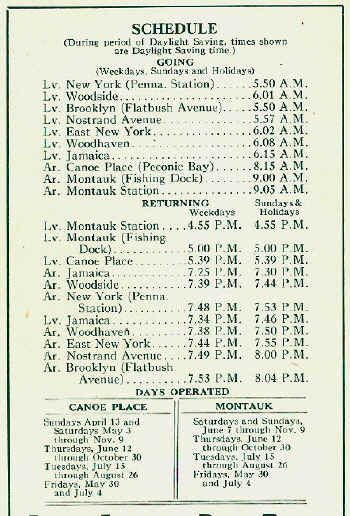 The line, which connected mainland Queens to Rockaway, made four stops: Goose Creek, The Raunt, Broad Channel, and Beach Channel, and accommodated far more passengers than the ferries. Within four years, as many as eighty-seven crowded trains chugged through the Jamaica Bay islands each summer day. The route was sold in 1887 to the Long Island Railroad, and by 1895, the trains carried a million and a half passengers. 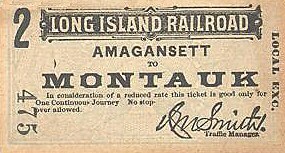 In 1902, three and a half million fun-seekers rode the line. 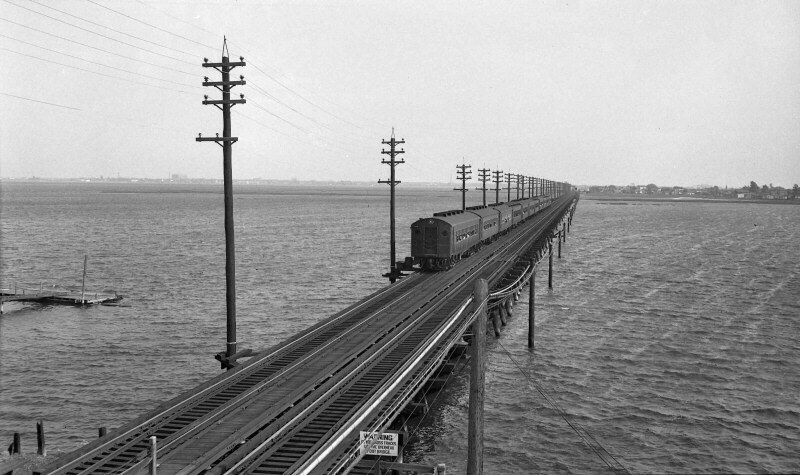 Rail transportation put Jamaica Bay on the map. 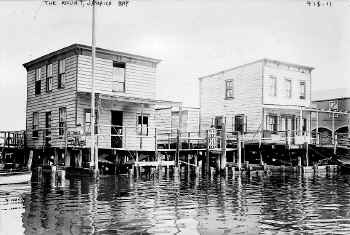 Tiny fishing shacks, boathouses, fishing clubs, and small hotels-many built on stilts-rose near the railroad trestle. 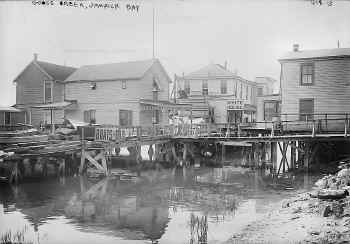 In 1906, an estimated four hundred fifty thousand tons of oysters and clams, valued at $2 million, were harvested from the bay. The Jamaica Bay islands were a homesteader's paradise during the late nineteenth century. The town of Jamaica had jurisdiction, but did not exercise title or collect taxes, encouraging squatters to settle there." Broad Channel is the largest island in the bay and the only one that remains inhabited. In the 1950's NY Parks commissioner Robert Moses razed the settlements on The Raunt and Goose Creek to create the Jamaica Bay Wildlife Refuge. 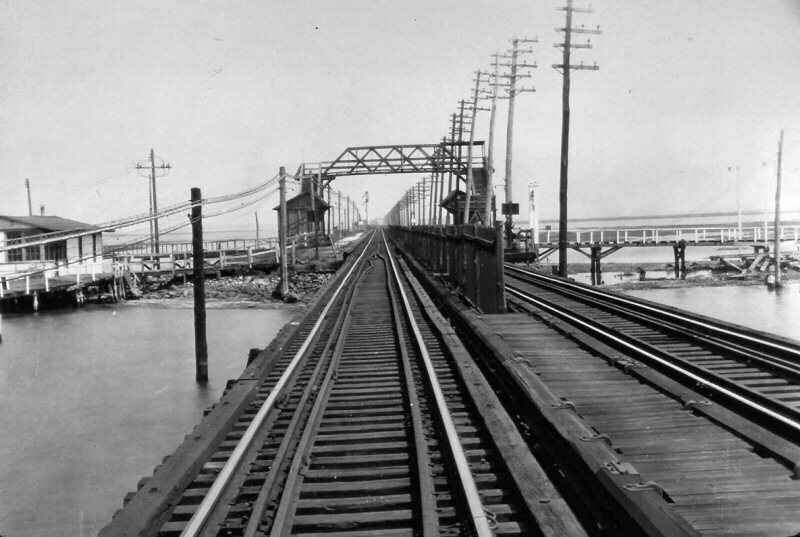 Moses struck a deal with the NYC Transit Authority to replace the old wooden trestle that had been plagued by fires for decades with a new subway trestle and bridge. The dredging and landfill required to build the new track also created a single island with two fresh water ponds for the newly designated refuge. 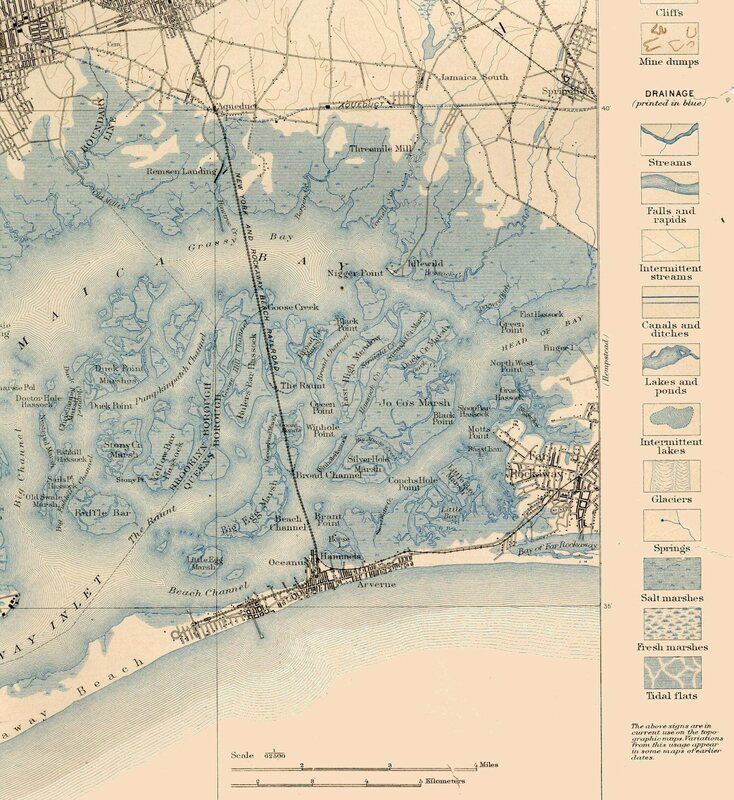 The Raunt bay colony takes it’s name from the Raunt Channel, which runs diagonally (southwest to northeast) through the marshes of Jamaica Bay. The Raunt Channel surrounds the Raunt community on three sides (north, east and south) and a narrow/shallow creek on the west side made the Raunt a marsh island in itself. There are a couple of other origins for the name of the Raunt Channel that are worth making note of. Scandinavian fisherman fished the waters of our Jamaica Bay in the New York areas early years, as well as the Dutch, English and Native Americans. Many Bay Locale names can be traced to Scandinavian origins. 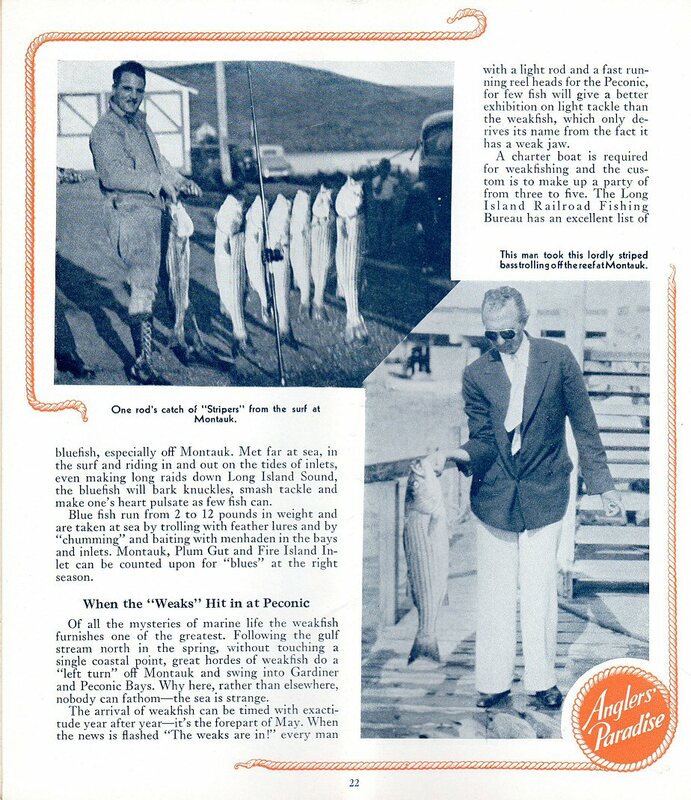 The Danish word “rogen,” pronounced “raun” translates to fish roe, and this part of the bay was a spawning ground for lots of fish. But where did the “t” come from? The Swedish word “rund” pronounced “runt” is the one that I favor. Webster’s Swedish Dictionary defines “rund” as around/in and around/here, there and everywhere. 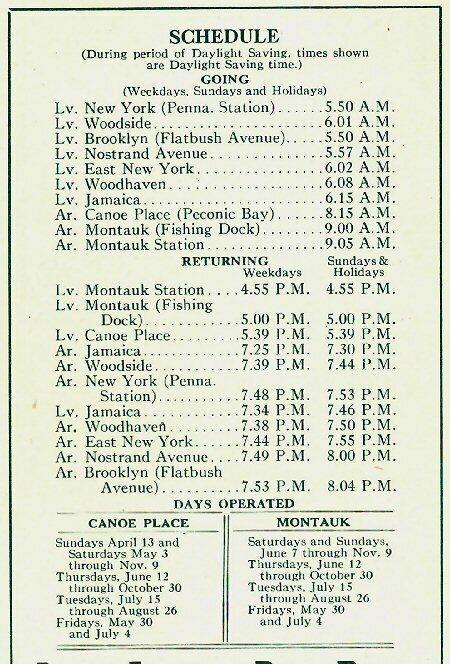 Before the landfill for the bird sanctuary by the “Pharoah” Robert Moses, one could get anywhere in the bay via Raunt Channel. 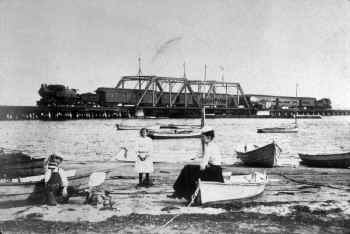 After the railroad over the bay opened, squatters put up fishing stations and boat rental floats on both sides of the trestle at the Raunt. The railroad didn’t seem to care as more riders meant revenue. Anglers getting off at the Raunt steadily increased during the first seven years. 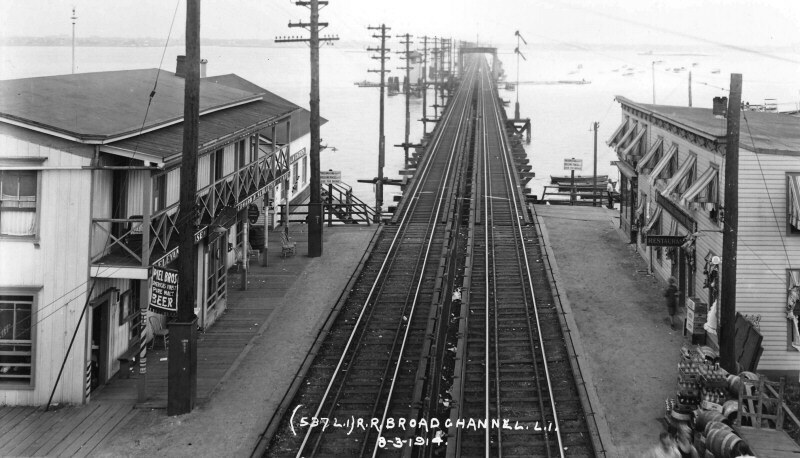 The LIRR, which now owned the bay railroad, decided to put up a station in 1888. A section of the right of way, 300’ x 48’, was leased to Christopher Murr or Muir and Elbert J. Kaltenbach, both of New York City, for ten years. The lease stipulated that these men would build a station and platform, and a large fishing station. 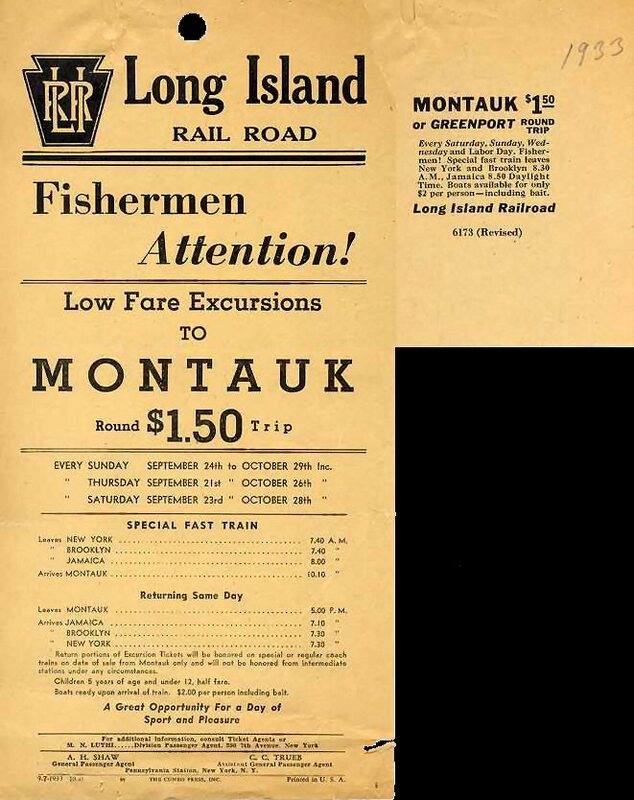 This they did and the LIRR put the stop on its timetable. The first bona fide leases at the Raunt were issued to James S. Williamson and Michael Hahn or Hann. These gentlemen were neighbors at the Raunt at the southwest corner alongside the trestle. The Raunt Station was on the southwest side opposite Williamson and Hann. In 1894 a listing for the Raunt told of the Patterson Fishing Club, Hann’s Liquors, Hann’s Boats and Phil Schappert’s Boats. In 1900, Flynn’s establishment was pulled out by winter ice, and the Co-Operative Society/Bay Trolley schemers were issuing eviction notices for people on their right of way. 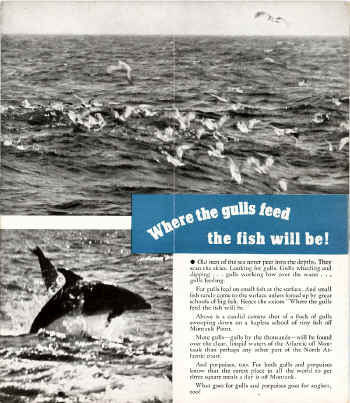 They issued a few leases to William Gralz of New York and the Dolphin Club. 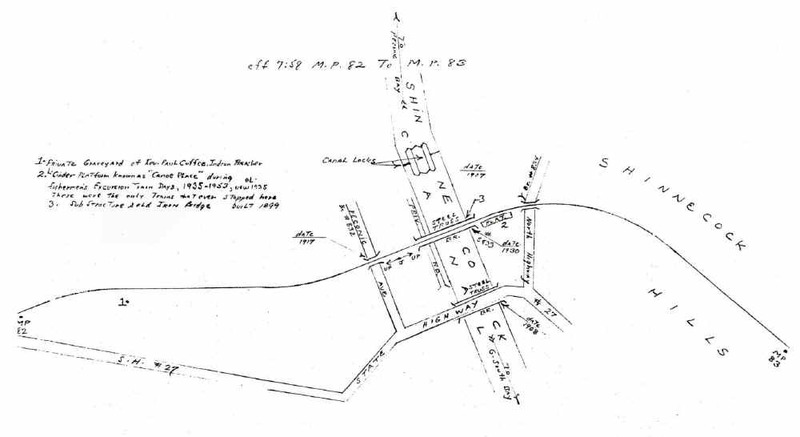 In 1902 the society issued leases to Richard Shoemaker of New York, at Swift Creek (west of the station), next to Cooper and Colbert. Mary V. Meeteer took over the Hann operation at the station. At the same time about fourteen leases were said to have been issued by the City Docks Department, shortly thereafter the trolley project died and the city had full control over the bay. Two years later, a James Jordan built a home, and two years after that, a huge fire almost destroyed the Raunt. Lost to the fire were Schwind’s Hotel, Vigilant Yacht Club, Liberty Island Rod and Gun Club, and part of the trestle. Rebuilding started as soon as possible, and by 1907 there were 16 structures at the Raunt, and this soared to 88 and then 100 leases at the exclusive Raunt Colony. 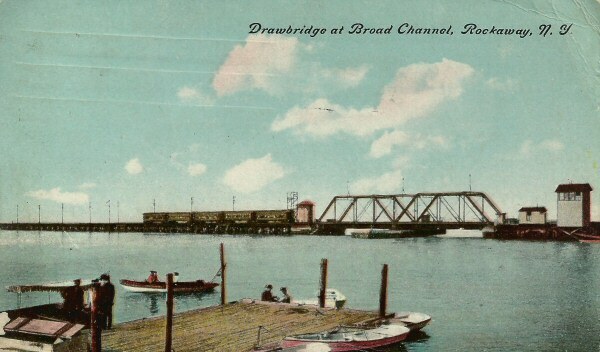 Later in 1915, the Raunt Marsh was leased to Pierre Noel, and all residents had to now sign on with Noel’s Broad Channel Corporation. 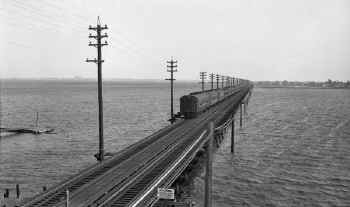 When Crossbay Road opened in 1926, the Raunt lost exclusive status; the place could now be reached by a road from Crossbay and a footbridge. 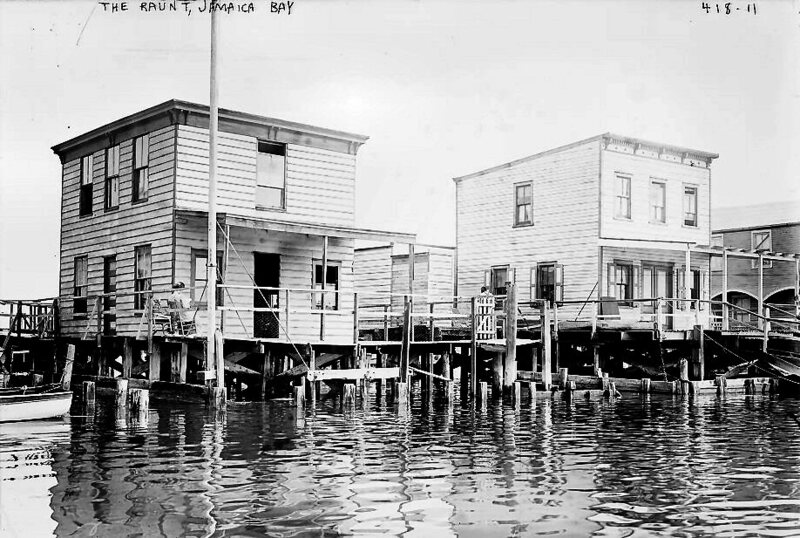 The colony suffered a great loss by fire in 1931, and by 1938 only one hundred people were recorded on a census. As the mid-1950’s approached, only fifteen structures were left, and the area was razed for the west pond of the Bird Sanctuary built in the area (R.I.P). 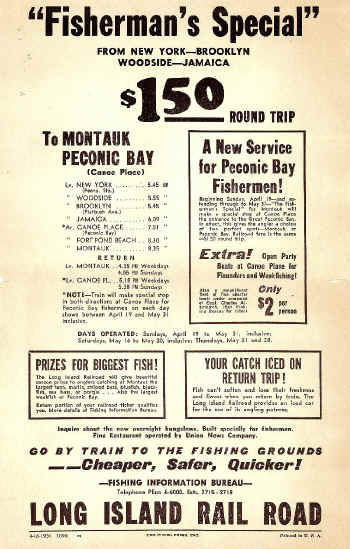 Home to the largest public fishing fleet on Long Island, Captree State Park is a fishing haven and a picnicker's delight, located on the eastern tip of Jones Island at the end of the Ocean Parkway. Open and charter boats are available for saltwater fishing. No license or equipment is necessary as the boat staff provides everything you'll need for a day on the Great South Bay or the Atlantic Ocean. 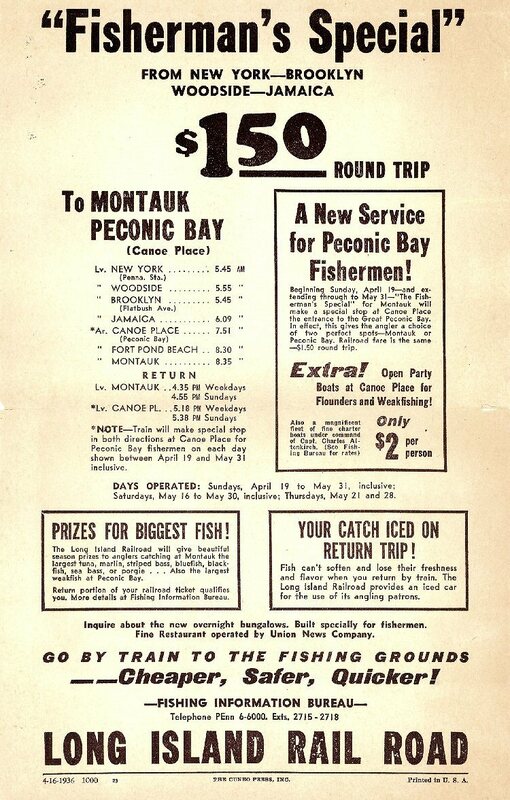 If you are unfamiliar with that Park, its main function is to serve as one of the largest places on the Island (save perhaps Montauk) to grab a "party" boat to go fish. Also a great spot for crabbing and fishing off a dock. Just watch the tide, it just whips through there except at slack water. 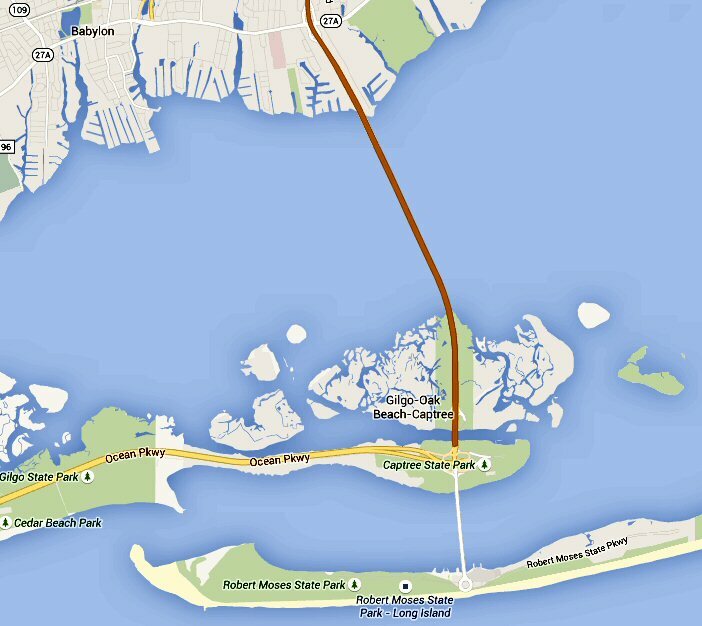 The only way I could think of is that the LIRR offered a package to go to Babylon and then a bus to Captree. 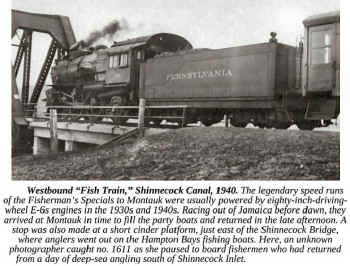 The Fish trains were once a big deal, a very early express train to go out East to drop off fishermen. 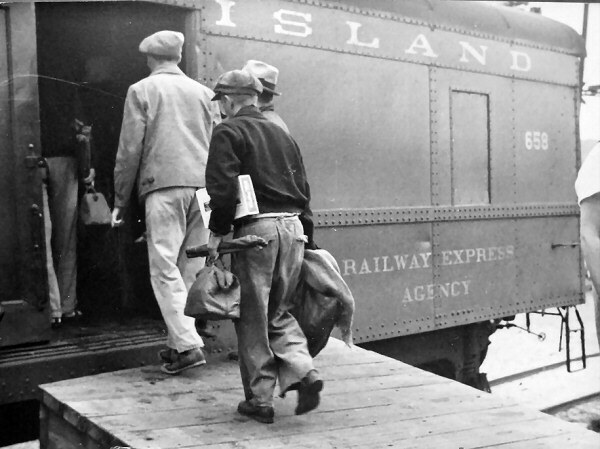 A box car loaded with ice was provided for the trip home for the angler and his catch. Must have been a fun train for the CAMs (Car Appearance Maintainer = Coach Cleaner) to clean back in Richmond Hill. 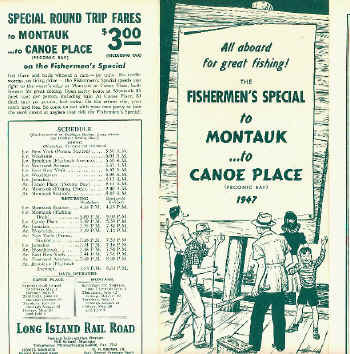 I didn't know they also made a stop at Canoe Place (seen from your page), that's great. Once a fantastic place for fish such as Winter Flounder and Weakfish (Sea Trout), and a easier walk than what you find at Montauk. 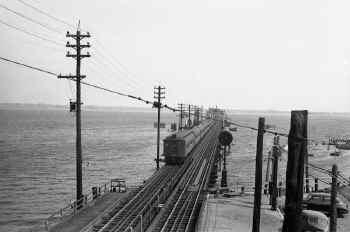 I believe before the hurricane of 1938 (LI Express), the bulk of the fleet docked near the older station in the area called Navy Dock, so picking up the party boats was much easier then.